I had a couple on my neck that bugged me. So I took invisible nylon thread and tied it real tight as close to my skin as I could, and in several days, they dried up and fell off. I had one above my eye a while back, but thought I should have an my eye doctor remove it. He used suture thread and tied it off. Wasn't tight enough so it never fell off, so I added my nylon thread in a tighter knot, and it did disappear. And he charged me 125.00!! When they show up I do them myself now. Testify, sister! I hate the bastards. Couple of shots for of Jack for you, razor blade for a friend (they can have their shots AFTER the procedure), and zip! They're history. Fantastic advice Wilma NC! Thank you! Wilma's got the idea - you can also use dental floss. Works like a charm. 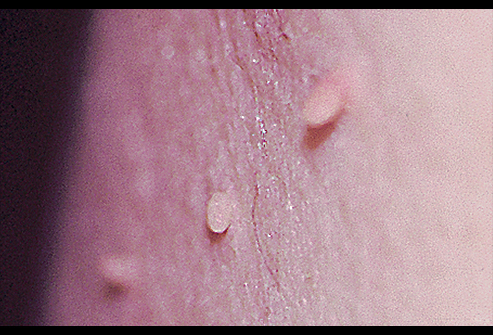 A skin tag remover kit is also a quite effective and painless method to remove skin tags at home.